Buffing enamel paint removes surface flaws like dry spray, dust nibs, orange peel and runs. Buffing smooths the surface of the paint. Buffing enamel paint isn't always recommended unless there are extremely noticeable imperfections and lack of shine. 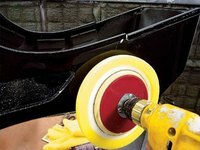 If you are looking to create a great looking shine or a swirl free finish, try buffing your enamel paint with a foam pad after the initial buffing. Wool pads run a little warmer and do not provide the same quality results as the foam pads do. Using a 1500 grit sandpaper, wetsand the enamel paint to remove imperfections. Attach a course wool pad to a 2500 rpm electric buffer. You can purchase the buffer at a tool or automotive shop. Apply a non wax buffing compound, sold at most automotive shops, to the buffing surface of your electric buffer. Plug the buffer in and turn it on. Slowly move the buffer into the car. Do not buff too fast or you will ruin the paint. Move the buffer over the entire paint surface, adding buffer compound as needed. Wash and dry the vehicle after buffing to remove all the extra compound and dust. Replace the course wool pad with a foam pad or a fine wool pad. Add a foam pad compound and re-buff the entire car. Wash the car and dry it well. In order to remove severe imperfections, it is advisable to wetsand the imperfections out of the enamel paint before buffing. Buffing an older faded vehicle will enhance the look of the enamel paint and improve the luster. If your enamel paint has micro-cracks in it, buffing the paint with a compound can actually cause it to look worse. The cracks can fill up with the buffing compound.